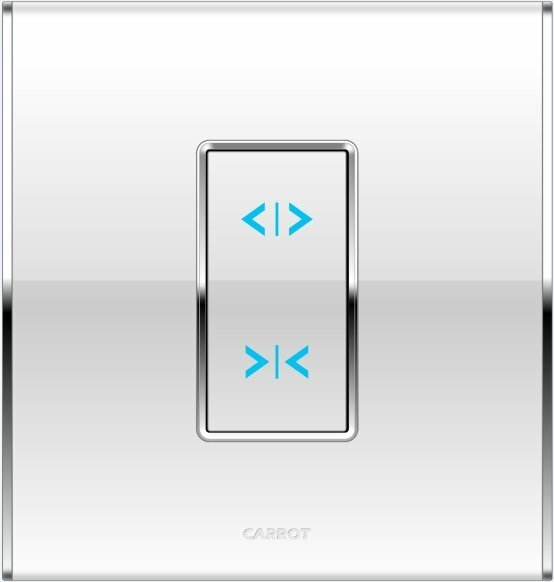 The exquisitely finished electronic curtain switch comes in one-gang and two-gang configurations. There are blue LED indicators on the buttons to indicate the motor running status (whether opening or closing). They communicate with Maestro and among all Carrot products via advanced two-way radio frequency communication to give reliable and accurate control over your curtains, blinds, projector screens and other 3-wire motor loads. Long press on each button position can be set to trigger a scenario such as turning all lights off and closing the curtain, an ultimate in simplicity and convenience.